I couldn’t wait for my oldest to start solids! I was sure it would mean longer stretches of sleep and who can argue with that right? My only concern was the amount of work that seemed ahead. I had friends who spent entire days, roasting, pureeing and freezing ice cube sized portions of baby food for their little ones, and honestly, it didn’t look like a lot of fun to me! When my daughter was about 5 months old, I came across a pin on good ‘ol pinterest about “Baby Led Weaning”. Intrigued, I clicked on the pin and it linked me to the book: “Baby-Led Weaning: The Essential Guide to Introducing Solid Foods-and Helping Your Baby to Grow Up a Happy and Confident Eater” by Gill Rapley. I pinned it onto my own board and a friend of mine commented that I should definitely look into it because she used baby-led weaning for all three of her kids and LOVED IT. I ended up e-mailing her, and asked her a few questions and when we were ready started using the method and LOVED it. I was so happy that I didn’t have to invest in a food processor, and those ice cube trays or those little glass food containers! It was also WAY less work . I’m certainly no expert on the matter, but I do have a little bit of experience now that our second is ten months old and eating solids. So, how does it work? At about six months, most babies are developmentally capable of feeding themselves proper food, in other words – no more mushy peas! Hooray! You just hand them the same food that you’re eating in an appropriately sized piece and if they like it they eat it and if they don’t they won’t. (But they do…trust me). That’s all there is to it! No purees, no ice cube trays, no food processor, no food mill, no expensive organic baby rice, or weird fruit and vegetable combos in pre-packaged baby food jars! Just you, your baby and the food that you’ve prepared for the entire family! Because, let’s face it, the more time you spend preparing baby food, the less likely they are to eat it, right? As I mentioned before, I have friends who would spend days steaming, roasting and freezing food for their babies, only to have them refuse it *insert bitter tone. * The best part of Baby-led weaning is that there is no pressure on your little one to eat. There really is no opportunity for mealtimes to become a battleground, so issues such as food refusal and food phobias are much less likely. I think it’s because there is no such thing as baby or kid food anymore. Everyone eats the same thing, so you don’t have to worry about introducing “real food” when your child is 4 or whatever. This method respects babies’ decisions what to eat or what not to eat and when to stop eating, so there is no need for battles to ensue. I LOVE IT! For our baby, we just cut the food into smaller pieces and allow her to pick what and how much to eat. Remember, when babies first start to eat solids, they probably won’t eat too much (unless they’re like my girls who practically gave up nursing as soon as we starting giving them “the good stuff”). Your little one decides how much solids they can handle and then supplement the rest of their nutritional requirements with milk (breast or formula). 1. Forget baby food. It was really hard for me to wrap my mind around this at first, but if you don’t want to, you don’t have to give your baby so called “baby food”. My oldest daughter’s first meal was chicken, potatoes and peas. She LOVED it. We just cut the chicken into finger-sized pieces and she ate it. 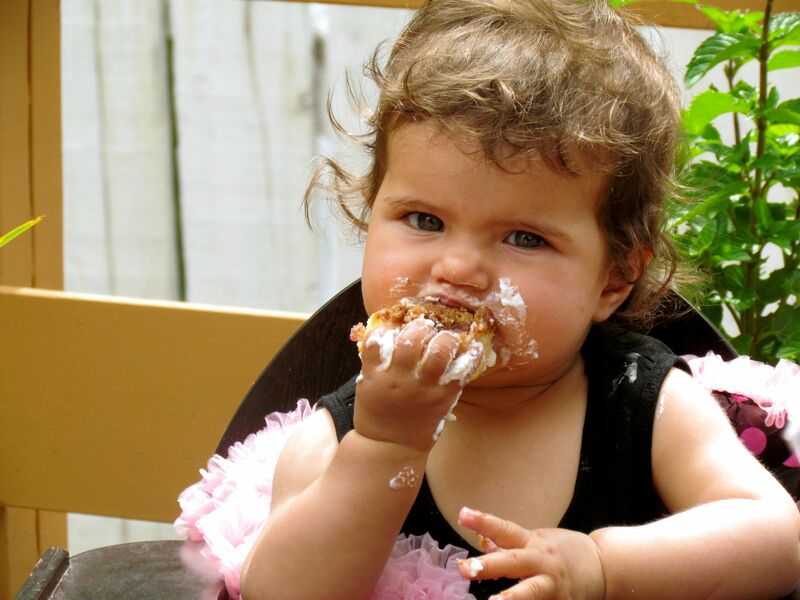 (She didn’t have teeth until she was 10 months old and still managed to eat it just fine!) My second daughter’s first meal was spaghetti. 2. Expect a mess. Put a few pieces of food (not too much food) on your baby’s tray and let them go to town! 3. Relax. With our first daughter, I was really nervous about choking. Remember, gagging is ok. It is a safety response to prevent choking. Babies seem to have very sensitive gagging reflexes, and that‘s good! 4. You know your baby best! Remember that!!! So, what do you think? Will you give it a try? I promise if you do, you’ll love it!! This entry was posted in Family, Kitchen and tagged baby, baby food, baby-led weaning, food phobias, food refusal, gill rapley, introducing solids, mealtime, solid food, toddler, weaning by theecohousewives. Bookmark the permalink.